Ollie Lockley produced the standout performance of the twelve local athletes chosen to represent Lancashire in last Saturday’s Inter Counties Cross Country Championships at Prestwold Hall, a country estate on the outskirts of Loughborough. In a race that was the selection trial for the Great Britain team for the World Cross Country Championships later this month, Lockley finished in a superb eleventh position, a performance that demonstrated that a British vest is a realistic target for him in the near future. The senior men’s and women’s races were both held over a distance that was officially given as ten kilometres, though the technology worn on the wrists of the competitors indicated that the distance was some 500 metres further than this. The decision to equalise the senior men’s and women’s distances this year was a controversial one which did not meet with the unanimous approval of the athletes – previously the men have competed over twelve kilometres and the women over eight. Lockley judged his race superbly over the rolling terrain on an extremely windy day, holding a position around the top 30 in the early stages before moving smoothly through the field as the race progressed. In the final quarter he found himself in a group of three battling for 11th place, but powered away to take the place with plenty to spare. It was a magnificent run, the only local athlete to have ever placed higher in the senior men’s race being Keith Gerrard who memorably won it in 2012. Alan Corlett, a late addition to the team, also produced his best performance at this event with a 58th place finish. Like his teammate he became progressively stronger and gained countless places in the second half of the race. The two Manxmen were part of the silver medal winning Lancashire team in the six-man team contest and were gold medal winners in the nine-man contest. David Mullarkey also earned plaudits for his 19th place finish in the Junior Men’s race which was the first event of the day. This was another mature performance from an athlete who has found great consistency this winter and who should do very well on the track this summer. The nine-strong Lancashire Senior Women’s team included a remarkable five Manx athletes, the biggest local representation ever in a race at these championships. Sarah Astin continued her rehabilitation from injury with a strong run for 28th place, looking noticeably fitter than two weeks earlier in the English National Championships. Middle distance specialist Rachael Franklin found the longer race distance hard going but as ever battled every step of the way to finish in a good 49th place. Elissa Morris celebrated her 30th birthday with a fine run to finish 123rd and looked to be enjoying the race more than anyone. Gail Griffiths was one of the oldest competitors in the field but proved that she is still competitive against much younger rivals with 175th place, while Karen Shimmin completed the Manx representation with a gritty run to place 184th. Lorna Spiers, still an under-17, helped the Lancashire team by stepping up an age group, and also in distance, to run in the Junior Women’s race. She placed a highly creditable 63rd in a race that also included the World Championship trial. Also placing 63rd in the under 13 girls’ race was Macy Hillier who ran impressively and looks to be getting back to her best form in time for the summer season. Ella Crowe has enjoyed a fine winter season and she continued in the same vein with a 113th place finish in the under 15 girls’ race in her first year in the age group. Sam Perry was the only member of the local contingent to debut for Lancashire this year, and he proved himself worthy of his county vest with a strong run to place 253rd in a big field in the under 13 boys’ race. He is in his first year in the age group and this experience will greatly help his progress in the sport. A reminder that the presentation evening for the Law Trust sponsored Isle of Man Cross Country League and Championships will take place at the Claremont Hotel on Loch Promenade in Douglas on Friday 22 March. The trophies and finishers awards for the league, and the medals for the Championships, will be presented. As in previous years, the presentation will be in two parts. From 7pm (doors will open a few minutes before) we will make the presentations to the under-nine, u11 and u13 age groups. Then after a short interval to allow the youngsters and their parents to leave and the older competitors to arrive, the presentations for all age groups from u15 upwards will begin at 8.30pm. A light buffet will be provided and the bar will be open – please come along and enjoy the evening! Competitor numbers taking part in cross country have been excellent this season, and no fewer than 205 individuals have won at least one prize! These include team medals for the Championships which were held at Crossags in January. If you are unable to attend the signing on evenings you will have the opportunity to sign on by post. Please fill in the Track and Field League Form 2019 and a cheque made out to Isle of Man Athletics Association and post to Petra Atchison, Ballasaig Farm, Maughold, Isle of Man IM7 1BJ. The fee for the League in 2019 will be £20 if payment is made before 28th March 2019; after this date it will be £25. Whilst you may sign on at the first competition evening it would be helpful to the organisers and other competitors if you could sign on at one of the signing on evenings or post the forms beforehand to reduce congestion on competition night. The Isle of Man Track and Field League starts on Wednesday 3 April at 6.15pm at the NSC Athletics Track, and will continue until 24 July 2019 (see dates below). Athletes will compete in age groups in selected track and field events during the six meetings of the league, with four weeks to count. Here is the event list for each competition date however a full timetable will be published on this website a few days prior to the each competition date. To allow the Track and Field League to run smoothly and to time we would ask if parents could assist for at least one evening in the season. You will be asked to do a non technical task like pulling the tape through, raking the sandpit or retrieving the cricket ball, discus or shot putt. You will be working with a qualified judge who will assist you. We will have a chart available and it would be greatly appreciated if you would put your name down for at least one evening in the Season. 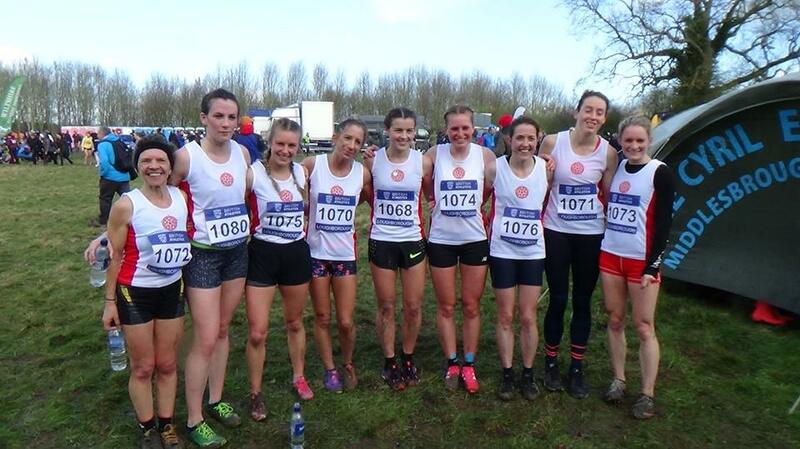 17 athletes from the Isle of Man, one of the biggest ever local representations, competed at last Saturday’s English National Cross Country Championships held for the first time at Harewood House. The thousands of competitors who assembled at the picturesque country estate north of Leeds basked in gloriously warm and sunny weather more akin to early summer than February. The extraordinarily dry winter had ensured that the ground was firm everywhere, in keeping with this highly untypical cross country season. These conditions suited some more than others. There were several terrific performances, making it difficult to pick one out as the best of the day by the Manx contingent. Perhaps that honour narrowly went to David Mullarkey, now Leeds-based so competing in what was a local event for him. His 14th place finish in the 10-kilometre Junior Men’s race was impressive indeed and one of his best-ever performances. He was part of the leading pack in the early stages, settling into a good rhythm once the leading runners had broken away and keeping calm and composed. A strong finish saw him cross the line in 14th place in a strong field of extremely good athletes. For the first time in four years Manx Harriers were able to field a team in the Senior Men’s race, with the best six results to count for the team score. In a field of over two thousand runners, Alan Corlett produced yet another confident and assured run to finish in 62nd place, his best result to date at this event. Birmingham-based Stephen Garrett was 167th with a strong and committed run, and Jamie Beaman improved on last year’s position with 510th place. Next came Ollie Dickinson in 709th, also his best result to date, followed by Andy Watson in 862nd and Andrew Falconer in 974th, the latter being delighted to break into the top half of the field. These six brought the team home in 46th place out of the 144 clubs that completed teams, a very creditable effort. Club stalwart Andy Fox completed the team in 1,168th place. Ahead of the Manx Harriers contingent was Ollie Lockley who finished 42nd running for the very strong Leeds City team who won the gold medal in the team event. Ollie frustratingly just missed out, being the team’s seventh scorer. Southampton AC’s Max Costley finished in a very good 117th place. Rachael Franklin produced another wonderful performance in the 8-kilometre Senior Women’s race, finishing in 24th place in a field of well over a thousand athletes. Working hard throughout but looking well in control, she held a position of around 30th halfway round the second of two laps before unleashing her usual surge at the end which gained several places. Manx Harriers teammate Elissa Morris, sporting a splendid pair of sunglasses, finished in a very respectable 105th place to improve on last year’s result by three places. 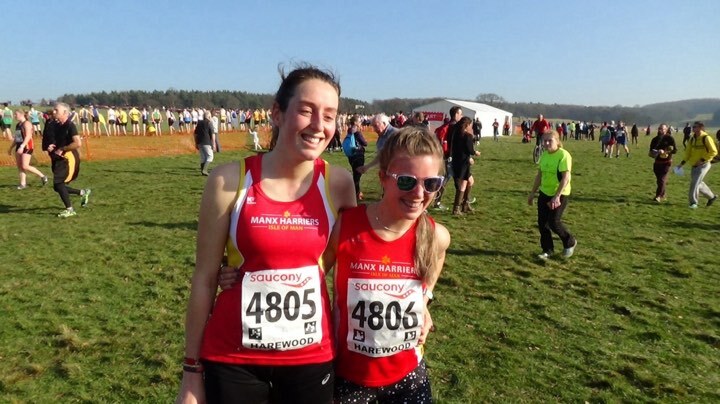 Sarah Astin, representing City of Norwich AC, was competing for the first time over the country this winter after injury, and finished in a solid 41st place. She was part of the bronze medal-winning team in the race, and aims to be fully race fit for the summer season. Four female athletes competed in the younger age group races and all achieved positions well inside the top hundred. Laura Dickinson of Manx Harriers, in her eighth consecutive National, gave her all as always to complete the Junior Women’s race in 94th place. Northern AC duo Lorna Spiers and Ella Crowe finished in 72nd and 87th places in the U17 Women’s and U15 Girls’ races respectively. Ella has had a fine season and ran as strongly as ever, and Lorna should be pleased with this result in a season during which she has not raced as much as usual. The youngest of the locals in action was Macy Hillier who finished 81st in a field of over 400 in the U13 Girls’ race. She was representing WESPA (World Elite Sports Performance Academy). Several Isle of Man athletes will be representing Lancashire at the Inter-Counties Championships in Loughborough a week on Saturday.